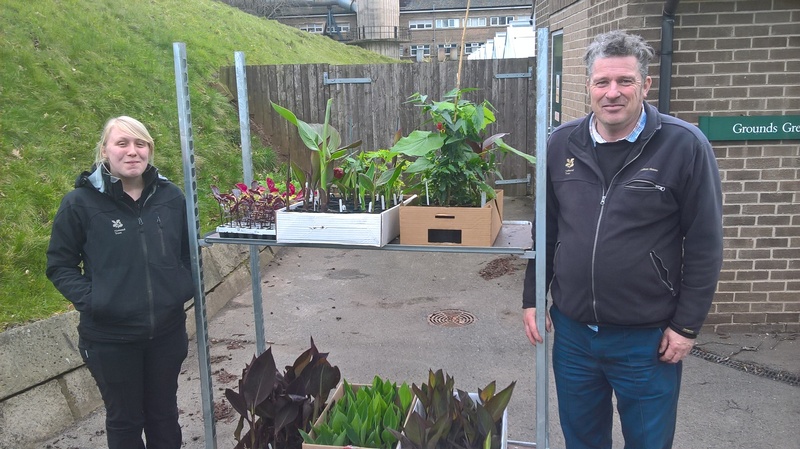 The University grounds team has taken steps to boost and futureproof our collection of cannas — a vibrant flowering plant that is a regular feature of UoN’s summer planting schemes. 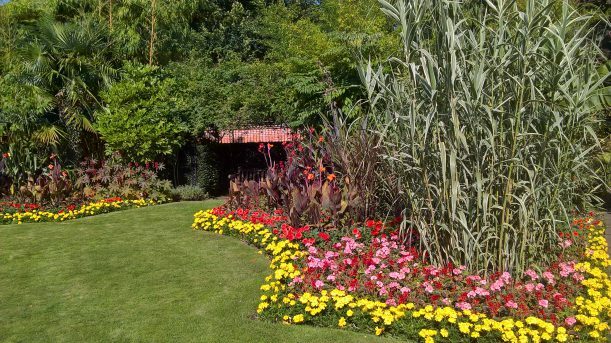 From 1994-2004, the University of Nottingham held a National Collection of Canna, which was located in the Highfields walled garden. However, the collection was largely destroyed after suffering from canna virus. Following this, canna propagation continued in the grounds greenhouse with the surviving canna cultivars, and cannas have remained a regular feature of UoN’s summer planting schemes. More recently the University has been working to increase its canna collection and has also helped increase a National Collection and donated cannas to a local National Trust garden of historic significance. This progress started early in 2018 when members of the University’s grounds team met staff from Hart Canna — the holder of the Plant Heritage National Collection of cannas — at the Malvern Spring Festival Garden Show. Discussions ensued and it was found that both the University of Nottingham grounds greenhouse and Hart’s nursery had canna cultivars that the other was missing. With this knowledge in mind, a swap of canna rhizomes was arranged with the aim of increasing both collections. In addition a link has been forged between the University of Nottingham grounds and the National Trust at Belton House near Grantham. The Italian garden at Belton is currently being gradually returned to its prime, with a Victorian layout and appearance. Following dialogue between the University and Belton House’s Head Gardener, Jon Lawrance, the University of Nottingham grounds greenhouse has donated heritage canna cultivars (hybridised between 1890s and early 1900s) to Belton to help in the restoration of its internationally historic garden. The heritage cannas are a very welcome and period correct addition to the Italian garden. Meanwhile, the University’s grounds greenhouse has increased its own collection further by receiving cuttings from four cultivars of abutilon growing in the Belton House orangery. In addition to helping a historic garden, donating cannas will also help preserve cultivars. 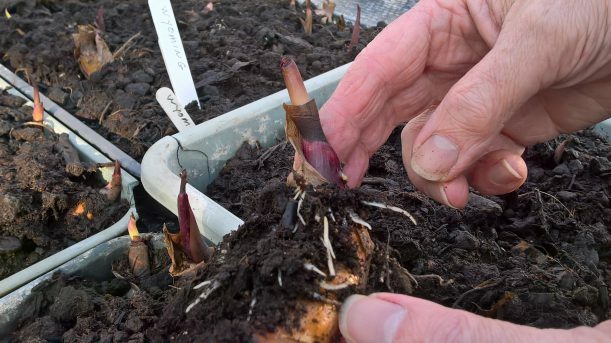 As a result of donating the University of Nottingham has secured a source of canna rhizomes should we be unlucky enough to see a widespread return of canna virus or another collection threatening occurrence. For more information about the University’s grounds and gardens, visit www.nottingham.ac.uk/sustainability/grounds/groundsgardens.aspx. I look forward to the arrival of the summer bedding plants each year. This morning as I cycled past I was excited to see that the plants were being unpacked and prepared for placement in the bed near the north entrance. The canna lilies are a highlight of the display, adding their height and a touch of the exotic. But the whole is greater than the sum of its parts; the combination of shapes, textures and colours, which somehow remains perfect throughout the season, always makes me smile on my way past. The end of the summer is marked for me by the lifting of the wonderful display, this always seems too soon. How lovely that our grounds team are building a reputation outside the University and engaging with the National Trust to work collaboratively to maintain plant stocks. The grounds are something which always bring positive comments on Open Days from parents and potential students and always cheer me up on my morning drive through the campus. Keep up the good work! The groundsmen do an amazing job – the flower, plant and tree displays on main campus are just wonderful, and we are very lucky people to work in such an environment. The grounds team at Jubilee work tirelessly, in all weathers to ensure that we have a beautiful campus to enjoy. The Gardens and Grounds are the best bit of the whole University. Can QMC part of the University please have a fraction of this on ‘our side’ of the A52? as we really miss out.